YPG/YPJ fighters from the Suwar and Marqadah fronts meet on October 14.
al-Hasakah - After days of fighting on the outskirts, SDF fighters have entered ISIS-held Marqadah. The future capture of Marqadah is crucial to the Kurdish-led war effort in al-Hasakah, as the town is the last ISIS stronghold in the province, only leaving the securing of both sides of the Khabur River as the last major objective. 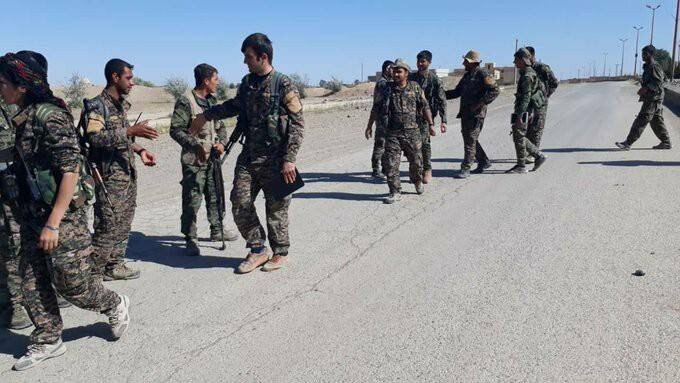 The SDF entered the area just before noon today, with the SDF bogged down in fighting around the Water Station and the local Police Department that ceased when the SDF secured the southern half of the town. It is unknown whether or not the fighting will become more intense when the SDF enters the northern half. Airstrikes by any air force have not been recorded in the area since 2016. ISIS captured Marqadah in March of 2014 from the then-named Jabhat an-Nusrah, in a battle that killed 120 in total over the course of just over a week.